Taylor Swift was spotted heading to her gym in New York City on Saturday. While she was only outside for a few minutes, she was quickly surrounded by fans and onlookers. The 24-year-old singer sported a coated print romper by SUNO featuring on-seam pockets and an exposed back zip. She accessorized with jewelry by Red C Jewels and a streamlined satchel by Bhailiu, and she completed the outfit with a pair of yellow Gucci suede pumps. How do you like Taylor’s black-and-white playsuit? It showed off Taylor’s famous long legs, and it looked like a comfortable outfit to wear on a warm day. Don’t miss these 7 celebrity style tips on how to wear jumpers and jumpsuits! 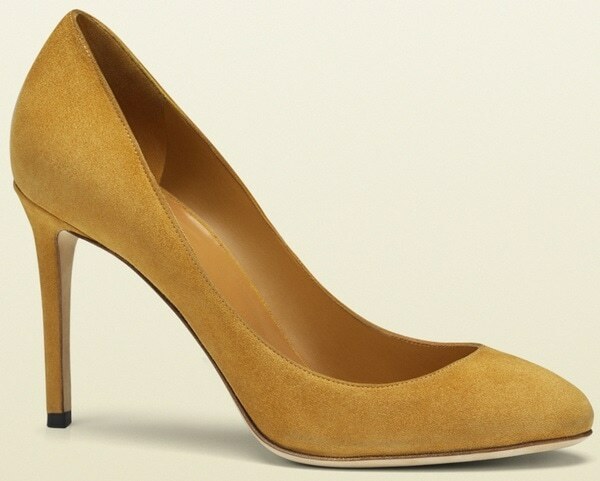 Taylor’s Gucci pumps feature a bologna construction, which according to Gucci is a specialized process resulting in a soft flexible shoe that conforms to your foot. There’s also a small interlocking G detail on the back heel and a metal logo under the arch of the shoe.